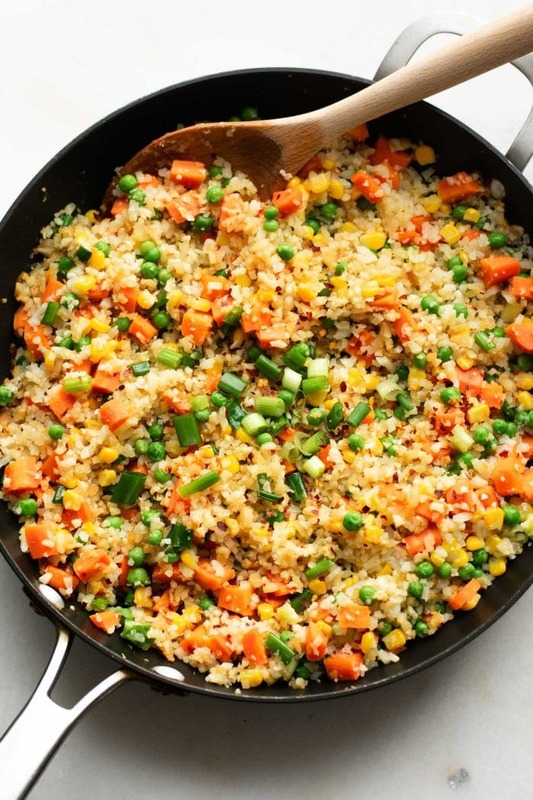 This healthy vegan cauliflower fried rice is so good, so easy, so healthy, so filling! 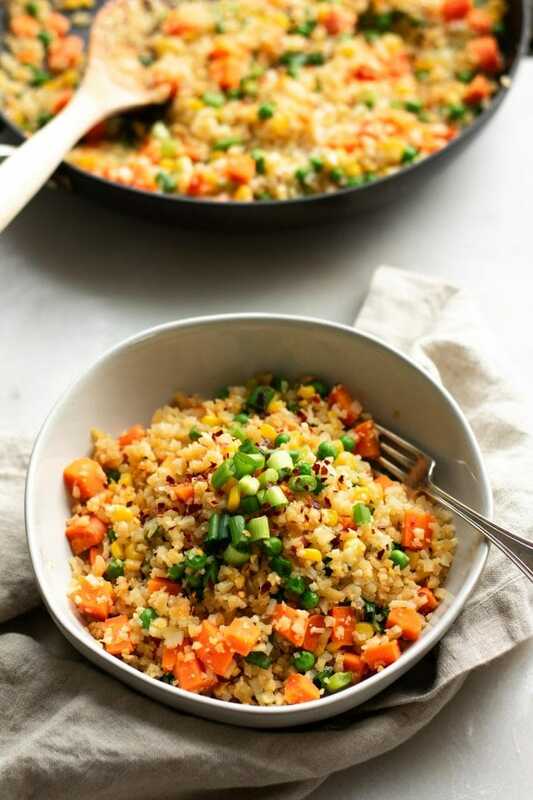 If you’re craving fried rice, this is the perfect, healthy, vegan alternative to the classic Asian dish. 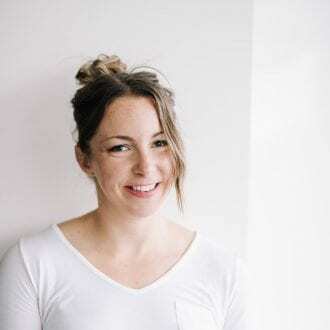 This recipe is really easy to make and one of my favourite weeknight dinners. It takes less than 20 minutes and even less if you pre the riced cauliflower ahead of time. 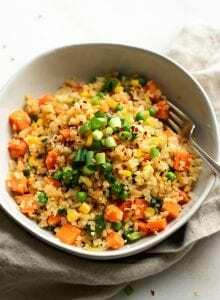 As for the oil in this recipe, although most of my recipes are oil-free, I would suggest keeping the sesame oil in this recipe as it really gives the dish that “fried rice” flavour. 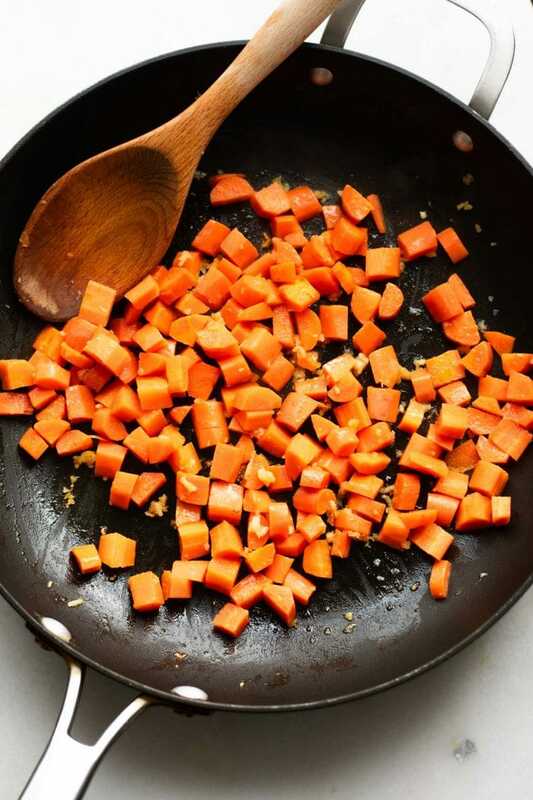 To make this dish, simply cook the garlic in a skillet with the sesame oil for a few minute then add the carrots and cook for another 3-4 minutes. Add the rest of the ingredients, cook it all up until heated through and serve. Wash a head of cauliflower then chop or break into large chunks. I like to break it up and throw it in a colander to easily wash it. Add the chunks to a food processor and pulse a few times until it forms a rice consistency. That’s it! 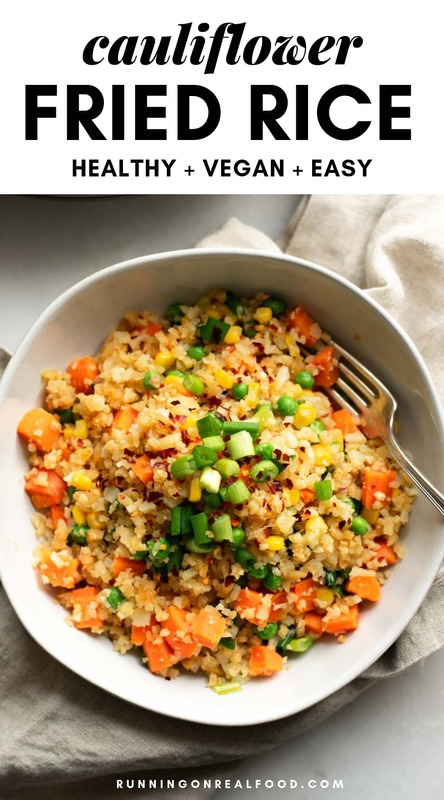 The riced cauliflower can be stored in the fridge and used in various recipes or used right away in this fried rice dish. This easy dish is ready in about 15 minutes, low in carbs and fat and provides 10 grams of plant-based protein per serving. It’s also very filling for just 183 calories per serving. To add more protein to this dish, I’d suggest adding chickpeas, edamame, baked tofu or marinated baked tempeh. You could also stir in some scramble tofu since traditional fried rice has egg in it. 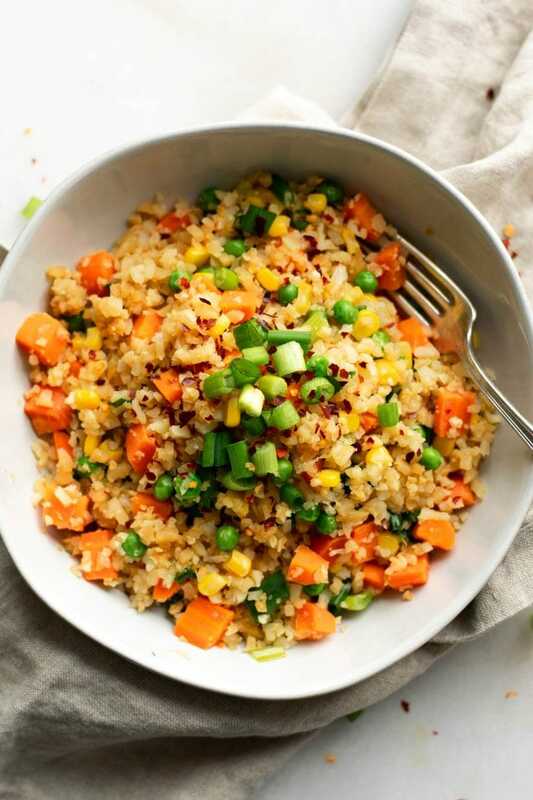 This easy fried rice dish makes a wonderful alternative to the classic Asian dish. Ready in just 15 minutes, this recipe is the perfect solution to busy weeknights. 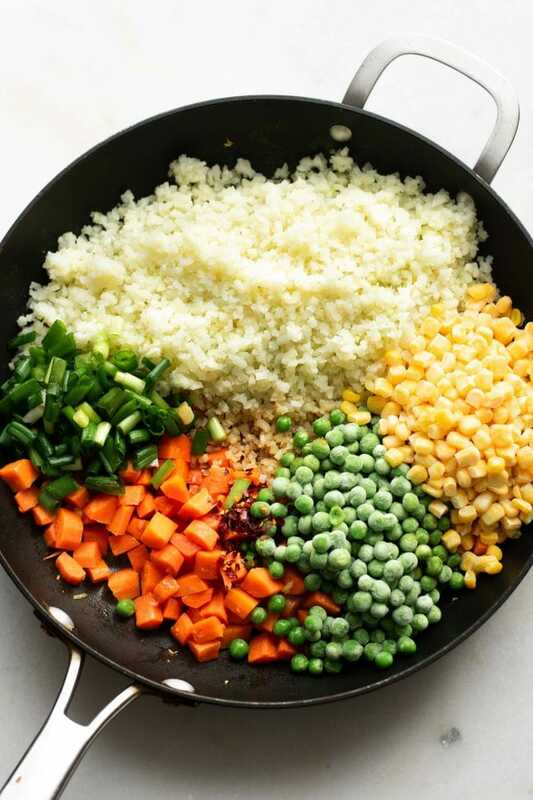 Add the red pepper flakes, riced cauliflower, peas, green onion, peas, corn and soy sauce. Cook for about 10 minutes until the cauliflower is tender, stir often. To rice the cauliflower, chop off the base of the crown and remove any large stems. Using your hands or a knife, tear the crown into large florets. From here you can either place them in a food processor and pulse a few times until broken down or you can use a grater. I prefer the food processor method. Cauli-rice is DEFINITELY something I have to try ASAP! I usually have it chopped and boiled, which isn’t bad, but sometimes you have to switch things up! I made this dish for my dinner. Well, I used it as an inspiration. I reduced cashews by half and roasted cauliflower with a tbsp of canola oil instead. I love its rich nutty flavour. Still low carb, low fat. Just perfect! I don’t see cashews in this recipe Kate? I love how simple this recipe it is…and so many veggies!! I’ve been finding simple recipe for the past hours and this is exactly what I want! Going to try it tonight! Just made this for lunch– amazing!! Yay! That’s awesome. I love this recipe, I make it all the time! It’s so quick and easy and tastes great. Thanks for the comment! hi deryn! 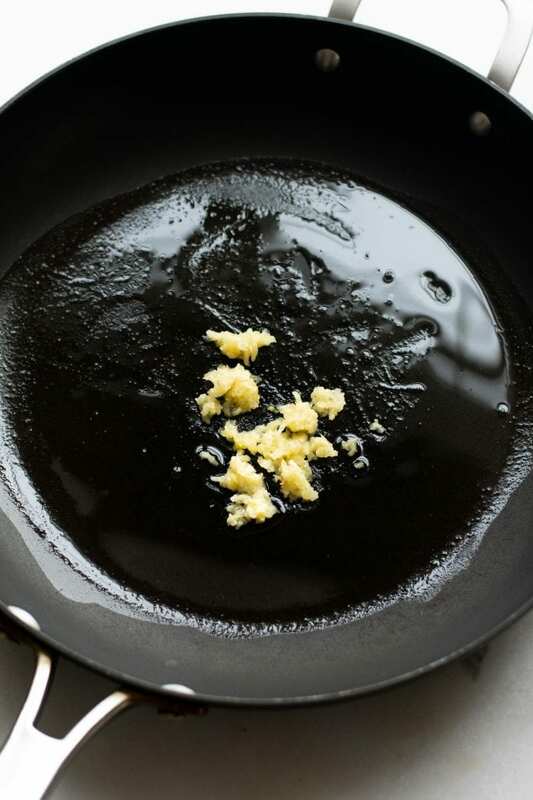 quick heads up, might e good to suggest that the soya sauce for this recipe be gluten free, because normal soya sauce actually contains wheat–which otherwise would make this recipe not gluten free. Thank you still for this, I enjoyed this recipe! Thanks for the feedback. Glad you enjoyed the recipe! Great recipe, I’ve made it a couple of times. Delicious! Soy sauce is not gluten free unless it states it on the bottle. Oh yes, sorry I forgot to note to use gluten-free tamari if needed. Thanks, will add it. Looks yummy!!.. Passing it on to my Daughter who is gluten free Vegan!! I saw a video of this recipe on Facebook and decided to search online for an easy vegan version. Thank you! This looks good but it is not grain-free. it has corn in it. Corn is a grain.